15 October 1889: born in Tôkyô in the district of Shintomi-chô. 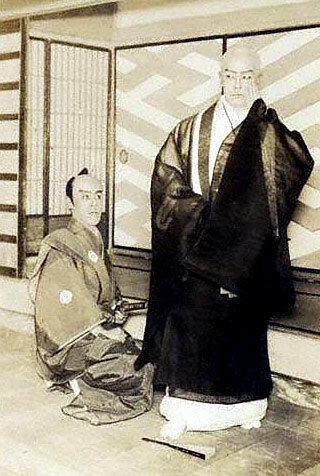 May 1894: debut on stage (hatsubutai), in Tôkyô at the Meijiza, where he received the name of Ichikawa Fukuzô II and played the role of Kuranosuke in the dance-drama "Orihime Shusu Yukari Iroito". 2 August 1907: his father Ichikawa Arajirô I died. September 1910: he became nadai and took the name of Ichikawa Arajirô II at the Meijiza, playing the role of Sakabe Sanjûrô in the drama "Yudono no Chôbê". January 1914: revival at the Hongôza of the drama "Gedatsu", a long-forgotten play belonging to the Kabuki Jûhachiban; Arajirô played the role of the Kabuki actor Sadoshima Chôgorô [more details]. Summer 1928: Arajirô joined the troupe led by Ichikawa Sadanji II, who organized the first tour of a Kabuki troupe outside Japan. The destination was the USSR and the troupe performed in Moscow and Leningrad [more details]. 23 February 1940: his master Ichikawa Sadanji II died. June 1942: revival at the Kabukiza of the drama "Kan U", which belongs to the Kabuki Jûhachiban; Arajirô played the role of Kajiwara Heiji Kagetaka [casting]. March 1947: Arajirô played at the Tôkyô Gekijô the role of Kansuke in the drama "Keian Taiheiki". November 1948: Arajirô played at the Tôkyô Gekijô the roles of Saibê, Kajiwara Heizô Kagetoki and Umakichi's corpse in the dramas "Ishikawa Goemon", "Kotobuki Soga no Taimen" and "Rakuda Monogatari". March 1949: Arajirô played at the Misonoza the roles of Hitachibô Kaison, Izumiya Seibê and the landlord, Rokurobê in "Kanjinchô", "Bunshichi Mottoi" and "Gonza to Sukejû". April 1949: Arajirô played at the Ôsaka Kabukiza the roles of Kitamura Daizen and the land-owner Jinpachi in the dramas "Kôchiyama" and "Bunshichi Mottoi". March 1953: premiere at the Kabukiza of Osaragi Jirô's drama "Edo no Yûbae"; Arajirô played the role of the sobaya master Ichibê [casting]. October 1955: Arajirô took part in the first Kabuki tour in the Popular Republic of China, in Beijing (2~13 october), Shanghai (17~18 october) and Guangzhou (24~25 october) [more details]. Arajirô had the opportunity to meet the stars of the Chinese Traditional Opera like the famous Mei Lan-Fang. January 1957: Arajirô played at the Kabukiza the role of Ôno Dôken in the drama "Kiri Hitoha". February 1957: Arajirô played at the Kabukiza the role of Kajiwara Saburô Kagemochi in the drama "Shizuka". April 1957: Arajirô played at the Kabukiza the roles of Kimoto Kazuma and the kumosuke Ômori no Isoemon in "Kesshôki" and "Suzu-ga-Mori". June 1957: Arajirô appeared on stage for the last time, in Tôkyô at the Tôyoko Hall, where he played the roles of the land owner Sakubê and the gang boss Akama Genzaemon in the dramas "Jûgoya Monogatari" and "Kirare Otomi". 16 June 1957: Arajirô died. Ichikawa Arajirô II was an important supporting actor, who made a long career from the end of the 1890s to the second half of the 1950s. He became a disciple of Ichikawa Ennosuke II after the death of Ichikawa Sadanji II. His kôseki was great and his best role was Kanakubo in "Shuzenji Monogatari". His others atariyaku were Iga Shichirô ("Muromachi Gosho"), Kyûsuke ("Onoe Idahachi"), the yakko Jisuke ("Imayô Satsuma Uta"), Hôzen ("Ogurusu no Chôbê") and Kitamura Daizen ("Kôchiyama"). Because of his long bulbous face, he was nicknamed Nankin Mame, which means peanut in English (his face).